I have very few memories of visiting Millstreet, Co Cork, as a child, although my grandmother, Maria (Crowley) Murphy, continued to live there, running a pub and a shop on the Square until she died 60 years ago on 8 July 1957 at the age of 72. I must have been about six or seven at the time I have two memories from – playing on the steps of the local branch of the Bank of Ireland and in the old Mill Race that gives its name to Millstreet. The Bank of Ireland branch on the Square in Millstreet was just a few doors away from the shop and pub my grandmother had owned. The bank is built in limestone in the Venetian Gothic style and remains a striking and imposing feature on Millstreet’s Main Street. It was designed by Brett and Sons as a branch of the National Bank, and is a fine small-town bank designed in a Vednetian Gothic with fine chimney stacks. The austerity of the stone façade is offset by the decorative emphasis of the openings, as well as the roof dressings. The Gothic style is unusual for financial architecture in Ireland in Victorian times, when architects tended to favour Classical elements. The limestone construction and dressings lend an air of authority to the building and give it a sense of elegance and authority. The exposed stone construction and simple design of the outbuilding contrasts markedly with the bank. This is a detached, two-storey double-pile bank and bank manager’s house, with a three-bay first floor with a doorway and a group of three windows to the ground floor, and a single-bay, single-storey, gable-fronted bay to the west. There is a hipped slate roof, cast-iron ridge crestings, rendered chimneystacks, over-hanging eaves, a carved limestone cornice and decorative timber bracketed eaves. The carved limestone gable at the front has a carved limestone finial and coping, with a pointed arch recessed panel with a chamfered surround and a decorative polychromatic patterned brick inset. On the ground floor, there is a group of three Tudor-style arch windows, a shouldered square-headed door opening at the front flanked by shouldered square-headed sidelights, pointed arch over-lights to the sidelights, and a Tudor-style arch over-light above the timber panelled door. The building is approached by the flight of cut limestone steps that I remember playing on in the late 1950s. The bank is set back from the street with dressed limestone castellated boundary walls that have carved limestone copings. Henry Elliott Herbert Shaw, who was the Bank Manager of the National Irish Bank in The Square, Millstreet in the 1940s, was the father of Ethna (Colleen) Shaw, who in 1949 married my mother’s first cousin, Timothy (‘Ted’) Crowley, of Coole House, Millstreet, and Finnstown House, Lucan, Co Dublin, a son of my grandmother’s brother, Cornelius (‘Con’) Denis Crowley (1879-1972), of Coole House, Millstreet, and Finnstown House, Lucan, Co Dublin. 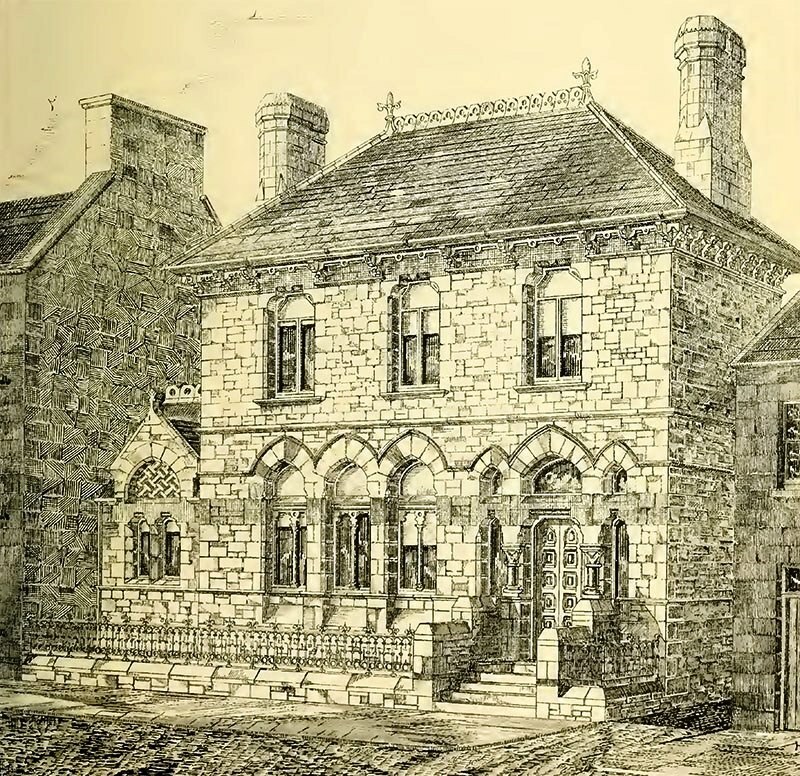 At the time the bank was built, the architectural practice of Henry Brett and Sons Civil worked from 49 Dame Street, Dublin, from about 1875 until the mid-1880s. The partners were Henry Brett and his sons, John Henry Brett and Henry Charles Brett. 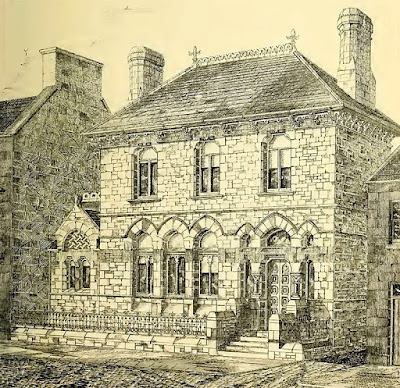 In the 1870s, the Bretts designed several branch banks for the National Bank, and after Henry Brett’s death in 1882, his two sons continued the practice as John H & HC Brett. As county surveyor for Co Wicklow in the 1860s, he was extremely critical of the waterworks that were being built by Dublin Corporation in Co Wicklow. Later, he was surveyor to Bray Township. Brett assisted Sir Richard Griffith in his valuation of Ireland. He carried out surveys for railway lines in Connaught under Sir John McNeill in 1843-1844, and made the first plans for the Irish West Coast railway. He was the engineer for the Dublin to Baltinglass railway scheme (1863-1864), ‘which had to be abandoned, entailing heavy pecuniary loss to himself,’ and the engineer to the Dublin, Rathmines, Rathgar & Rathfarnham railway (1868-1874). Brett died at his home at Rosemount, Booterstown, Co Dublin, on 13 May 1882 and was buried in Deansgrange Cemetery. Although I remember few childhood visits to Millstreet, Co Cork, those memories in including playing at the steps of the mill that gives its name to Millstreet, and playing on the steps of the local branch of the Bank of Ireland, a few doors away from the shops, pub and home of my grandmother, Maria (Crowley) Murphy, who died 60 years ago on 8 July 1957 at the age of 72. My grandmother is buried in the cemetery beside Drishane Castle, and from early times the parish was known officially as Drishane. But a village grew up west of Drishane Castle around the mills that were operating in the early 18th century, and the village and town around these mills became become known as Millstreet at an early stage in its development. In his Topographical Dictionary of Ireland, Samuel Lewis notes that before 1736 Millstreet consisted of an inn, a mill, and five small cabins. The earliest mill in the town was the Black Gate Mill located on Station Road, using the River Finnow. Corn milling was increasingly mechanised in the latter half of the 18th century, and the mills were given fresh impetus in 1758 when the Irish Parliament introduced a subsidy for transporting flour to Dublin. In Co Cork, large flour mills developed in towns such as Macroom, Fermoy and Castletownroche, and the county had 32 mills in the late 18th century. A large mill was built on the site of the present mill in Millstreet in the 1820s. This was much larger than the other three mills in Millstreet at the time, and had a wooden wheel on the north (station) side. This was later replaced by a steel millwheel operated by the mill race on the south (town) side of the mill. A brewery was built in Millstreet in 1835, and two years later Lewis observes that Millstreet had one long street in 1837, with several smaller streets and lanes leading off it, and 312 houses that were small but neatly built. In addition, Lewis notes, Millstreet had many flour mills that ‘have proved very advantageous to the farmer in encouraging the growth of wheat.’ The other mills in the Millstreet were at Mount Leader, where there were two mills side-by-side at Dromacolane Bridge, also known as the Miller’s Bridge, and the Black Gate mill, which was the first mill in Millstreet. The Wallis family of Drishane Castle bought the mill on the north side of Millstreet in 1856, adding to their other enterprises in the town, which included the brewery, a sawmill and a tannery. The O’Donnell family of Coole House, who were the stewards of the Wallis family on the Drishane estate, became the owners of the mill in 1864 when it was bought by Nicholas Michael O’Donnell, who married a year later. But the mill must have fallen into financial difficulties, and in 1870, describing himself as a miller, Nicholas O’Donnell filed for bankruptcy. In 1875 Maurice Hickey of Castletownroche bought the mill. He made many improvements to the mill, changing the location of the mill wheel from the station or north side to the town or south side, and upgrading the building of the mill from timber to steel. But once again the mill fell into financial difficulties by 1912, and it was bought that year by John D Murphy of Coomlegane Street, Millstreet. Following rebuilding works by John D Murphy, the mill was bought by Andrew O’Regan, my great-uncle by marriage, soon after his wedding. My grandmother’s younger sister Johanna (‘Hannah’) Maria Crowley (1882-1964) married a much younger Andrew O’Regan (1895-1984), son of Jermiah O’Regan of Kilmurry, on 16 September 1919 in Cork Cathedral. The witnesses were Jeremiah O’Regan and Bridget Crowley (1887-1976), a younger sister of my grandmother and my great-aunt Hannah. Hannah and Andy O’Regan were the parents of two sons and two daughters, and today the mill is run by a third and fourth generation of the O’Regan family. I was probably a six or seven-year-old at the time I remember playing in the mill stream and the mill race that feeds into O’Regan’s Mills. On Sunday afternoon, as we climbed the steps beside the old mill race, my cousin recalled my precocious daring-do attitude and feigned bravado as I led younger cousins across the mill race, only to fall on my backside and to suffer a humbling soaking. I had learned at a very young age how pride can come before a fall. Appropriately, a mural of the old mill race and mill stream as they looked around 1910 is painted on the new gable created on the side of the former home on Main Street of my grandmother’s parents, my great-grandparents, Denis Crowley (1853-1912) and Margaret (Twomey) Crowley (ca 1845-1923) when Mill Lane was widened some years ago. but the old mill stone has long gone. on its erstwhile bed, the lilac grows. and consign the stream to its silent death. But the old mill stream lives on in my heart. And leaps from the past with a mighty start. And it is if I am a child again. And I watch the stream as I watched it then. When the sluice gate opened to let it pass. And rumbled, and grumbled, and bubbled and belled. was a feat for a daring child to try. on the sunny steps by the mill each day. And bring back the past to you and me. But the children haven’t changed a lot. And it seems like the ghost of the stream is there. Echoing soft on the summer air.